Zlatan Ibrahimovic’s agent is trying to sell him to Juventus, but there have been different rumors about whether the club is interested. According to Calciomercato.com Juventus has now closed the door. At the same time Tuttosport today reveals that Juventus do everything they can to get Edinson Cavani. Gazzetta dello Sport has for several weeks written that Juventus want to have Zlatan Ibrahimovixc. Reputable Sky Italia has however reported that the agent Mino Raiola has been given a no when he tried to get the club to take up the recruiting of Zlatan Ibrahimovic. Now calciomecato.com writes that Juventus “closed the door in the face” to Zlatan Ibrahimovic. Instead, Gonzalo Higuain be the main target for Juventus. He joins already signed Fernando Llorente as the a new attacker. Several media have in recent days reported on meetings with Real Madrid for Higuain. 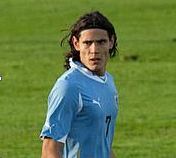 Today the Turin newspaper Tuttosport writes that Juve are willing to do a lot for Napoli’s Edinson Cavani. The newspaper club mentiones the club is still working on Ibrahimovic, Higuain and Stevan Jovetic, but they have already come up with a proposal to Napoli. According to the magazine Juventus sporting director Fabio Paratici and Napoli sporting director Riccardo Bigon already met, and Paratici should have offered 30 million euros, plus either player Mirko Vucinic, Alessandro Matri, Mauricio Isla and Paolo De Ceglie for Cavani . This entry was posted in Uncategorized on May 9, 2013 by Johan Bengtsson.